Jan Goyvaerts runs Just Great Software, where he designs and develops some of the most popular regular expression software, including RegexBuddy, RegexMagic, and PowerGREP. RegexBuddy is the world's only regular expression editor that emulates the peculiarities of 15 regular expression flavors. RegexMagic is the world's only tool for generating regular expressions using powerful patterns instead of the cryptic regex syntax. PowerGREP is the most feature-rich grep tool for Microsoft Windows. "This book shows all the careful attention to detail and thoroughness of preparation that I expect in a definitive reference volume. Recommended as an integral part of every developer's bookshelf." "Regular Expressions Cookbook 2nd Edition is a great resource for both beginners and experts. Not only does it provide recipes for solving common regular expressions problems but it does a great job of explaining how they work so that you can use that knowledge to start building your own..This book deserves a place on every programmer's bookshelf. " "The authors manage to combine the friendly attitude found in Friedls work, but the quick ability to solve problems in a variety of languages common to the Cookbook series." "It's the book that you put on your shelf and pull out whenever you need to look up a few specific patterns." "Im giving this a 9/10 and I really recommend it to those guys which are looking to learn more about regular expressions or that need to buy a good reference book on the topic." "For everything that the book is and everything that it covers, the book offers a lot of information at a bargain. If you work with regular expressions and need a reference book, this book is definitely the way to go." "The Regular Expressions Cookbook is well-written and well-illustrated." "If your work regularly brings you in contact with regular expressions, youll want to arm yourself with this. Highly recommended." "After a very good, fast paced introduction to regular expressions, the following chapters contain various detailed recipes for solving particular tasks, ranging from the simple to the absolutely scary. Many recipes are not just about regular expressions, but also about interesting stuff like telephone numbers or XML." "Regular Expressions Cookbook manages to be simultaneously accessible and almost ridiculously comprehensive. The problem, solution, discussion format lets you learn regular expressions as needed, without being overwhelmed by their Swiss army knife complexity. I consider myself a fairly advanced regex user and about 50 pages in I've already had three big 'oh, wow, I didn't realize that' moments." "Regular Expressions are a timeless technology; and, the Regular Expression Cookbook will surely prove to be a consistent source of both information and inspiration for years to come." "What I was looking for was a book that would teach regular expressions while giving concrete examples of real life use cases that I could immediately put to work. This book is filled with them...The best part of the book is that every example uses a clear format that sets the stage for an easy discovery of needed information...This book will be used regularly as a reference." "I love the O'Reilly Cookbook series. The format is very usable, and very helpful. This book continues the trend. This book fully met my expectations, giving me easy access to syntax for common Regular expression problems I need to solve. The recipes are all practical, but solve a range of simple to complex problems. I will keep this book close by and use it often, it is a great reference tool! " "Overall the book is useful if you want to either extend your knowledge of regular expression or really do need help with a specific problem...If what you really want is a cookbook then this is as good as it gets." "This is hands-down the best book on the regular expression written by the Reg-Ex guru Jan Goyvaerts himself. Sysadmins and DBAs who write administrative scripts in Perl should definitely have this book as a reference. This is a must-have for programmers of all languages. When you have this book in your desk, regular expression will not look intimidating at all." "...a book for the true geek to curl up with and read. You may not need the information now, but you will need it someday and just browsing is an effective way to pick it up. Likewise, if you're looking for an immediate solution to a problem right now, just check the Table Of Contents...In short, this is the newest benchmark reference for Regular Expressions. With this and Mastering Regular Expressions, you are going to be a Master of the Universe and do things with text that will leave ordinary mortals awestruck. " "After buying the 3rd edition of Mastering Regular Expressions by Jeffrey Friedl about 2 and a half years ago I thought I would never read another book about Regular Expressions again. That was until I saw Jeff Atwoods review of Regular Expressions Cookbook by Jan Goyvaerts and Steven Levithan. Now I have been known in the past to buy and read a book based on the suggestion of Jeff Atwood so who was I to say no this time...This book will be a useful reference for some time to come." 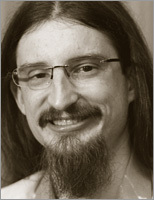 --Martin Jagger, Martin C# and .NET Fanboy! "...an awesome book. Not only does it contain a huge number of "recipes" for using regular expressions to solve real world problems, it has a thorough and easy-to-follow tutorial on what regular expressions are and how they work. Even if you are someone who feels very comfortable with regular expressions, I would highly recommend reading the tutorial - you will definitely learn things that you didn't know before. I certainly found myself dog-earing some new tip every few pages... I highly recommend this book for anyone who wants to get into regular expressions for the first time or for anyone who wants to take their existing regular expression skills to the next level." "Just from what Ive read so far and scanned from later in the book, this looks like it will be THE book on regular expressions. I made a huge leap forward with the OReilly Mastering Regular Expressions book, but this one looks like it will make an even bigger impact for regex users. This book is just so well-written and thought out. Even though you guys are explaining a complex subject, everything feels very straightforward and easy to grasp. The tutorial is excellent, and the cookbook part is great for showing examples with common regex uses. Thanks for writing this book!" "...a good addition to any programmers bookshelf. It is well written and concise and has lots of very useful receipes - such as URL/Paths/Addresses manipulators (getting host, frame, email address etc), and some very useful ones for specific formats, such as date formats, phones numbers, zip and UK postocdes. What's really impressive is the book provides useful links to reference materials (RFCs, Telecoms standards, British and ISO standards). "